We enjoyed meeting delegates at the Association of Electoral Administrators annual conference in Blackpool, 4-7th February. It’s always a thought provoking and informative event, and a good opportunity to meet with fellow officers in the electoral field. Clearly Electoral Officers and their teams have steady hands and nerves of steel judging by the impressive scores in our 'Buzz Wire' game challenge. Congratulations to the winners each day who completed the game with minimum beeps. 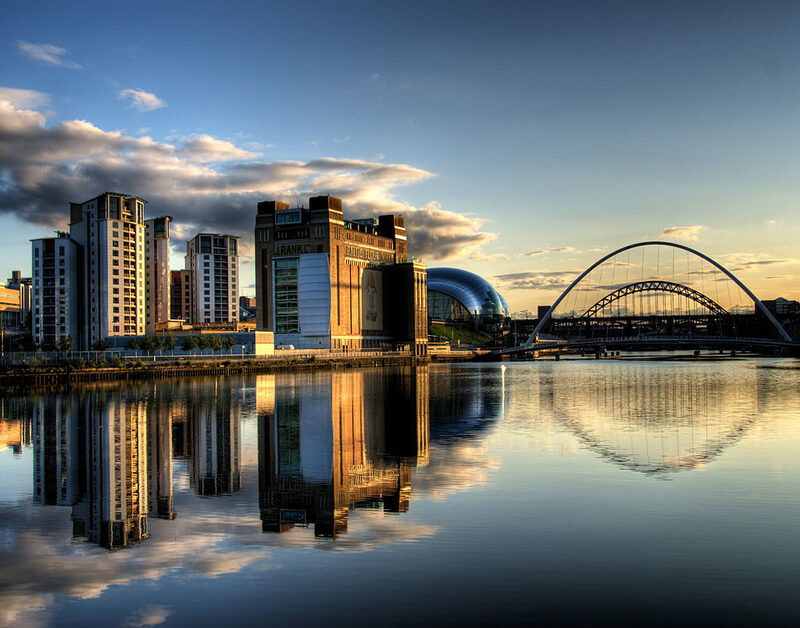 Read more about our services here. Well done team Stephen Austin! 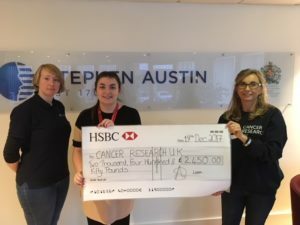 We all enjoyed taking part in this charity initiative and raised a fantastic £2450.00 for Cancer Research UK. This is one of our Corporate Social Responsibility activities - and great fun too. An example of life at Stephen Austin - read more about joining our team. Our new Senior Account Manager We’re pleased to welcome Elizabeth Bowerman to the Client Service team as Senior Account Manager, responsible for our electoral business, supported by Christie Wilkinson. Elizabeth has spent her career working within the print industry, operating in account management and project management roles. She brings significant experience and knowledge to our team. Stephen Austin is committed to maintaining high security standards in every aspect of product and service delivery, which is again demonstrated by successful 2017 accreditation to the Cyber Essentials PLUS standard. In 2012, HM Government launched the 10 Steps to Cyber Security guide to encourage organisations to consider their cyber security measures, and to ascertain whether organisations thought they were managing their cyber risks sufficiently. The guide was received well and further expanded by UK Government to a de-facto standard. The adoption of an organisational standard for cyber security was seen as the next step. Concluding in November 2013, the Cyber Essentials scheme defines a UK cyber security standard, which organisations can be certified against. The rationale behind this was that it would enable organisations and their customers and partners, to have greater confidence in their ability to measure and reduce cyber risks, as they would be independently assessed on a frequent basis to ensure adherence to the standard. Business leaders at Stephen Austin have taken ownership of their cyber risks and built them into their overall corporate risk management regime. At the same time, Stephen Austin has extended the scope from Cyber Essentials that incorporates assessment of the systems exposed to Internet to Cyber Essentials PLUS, where the assessment is also covering internal security assessment of end-user devices. Once again, this directly tests that individual controls have been implemented correctly and recreates various attack scenarios to ensure Stephen Austin's readiness to respond and protect itself and its clients from internal and external cyber threats. Visitors to Stephen Austin this summer may have noticed some colourful additions to our car park. 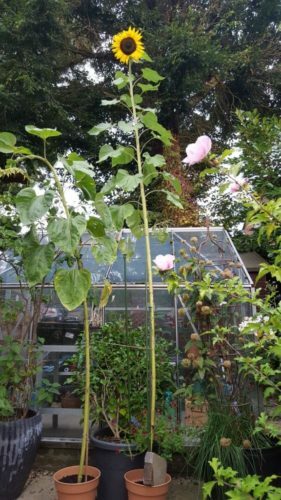 The Company’s ‘Grow the Tallest Sunflower’ competition had some keen rivalry and spectacular results – although Miracle Grow was suspected… Jamie’s sunflower was declared the winner – the spectacular bloom reached an impressive 325 cm. Just part of life at Stephen Austin. Thank you to everyone who visited the Stephen Austin stand at the Association of Electoral Administrators Conference on 3rd July. There were some useful sessions at the conference this year. Minister for the Constitution, Chris Skidmore MP’s presentation was particularly thought provoking. So much being accomplished by so few! Good to hear the professionalism and dedication of Electoral Administrators and their staff being recognised. To read the full speech, please click here. We take great pride in our accreditations, they are a measure and indication of everything we do. Our Standards and Compliance team have been successful in passing the audit to confirm our Anti Bribery certification, which is unique in our industry. It is with great pleasure that we welcome…. Sam Jones who brings her extensive knowledge of electoral services to our Sales Team, and our new Fulfilment and Logistics Manager, Madan Natarajan who will ensure that our despatch continues efficiently and on time. We are very proud of our four intrepid runners, who successfully completed the spring Cambridge Half marathon. Andy, Chris, Darren and Steve braved the English weather to deliver very respectable times. Our Sales Team got into the Red Nose Day spirit, with cakes and competitions. The Company matched the funds raised by the team to purchase TuTu desks for school children. Tutu desks are a vital resource for schools where desks are not available, enabling students to have a clear working surface for writing.